This baby boy shower has the theme of Mustaches, but you can easily make any theme work for both the Lunch and Dessert menu. 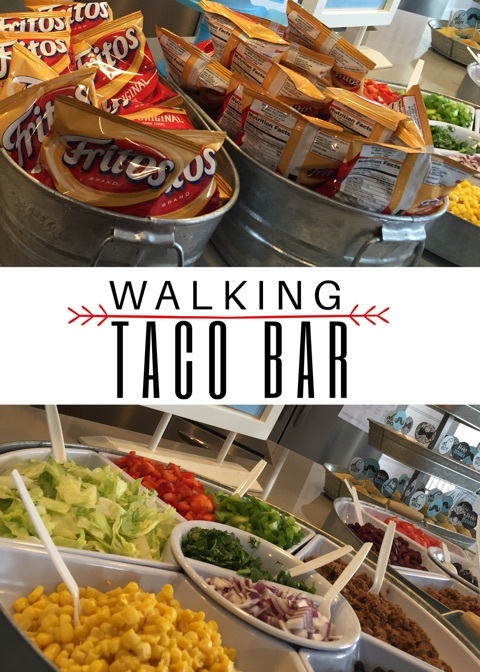 Have you heard of, Walking Tacos? They are one of my favorites!! there is something for everyone!! You have them put all the ingredients right into the Frito bags, add the dressing and your ready to walk around and mingle!! I served other things in addition to the walking tacos. Texas cole slaw salad and individual cornbread cupcakes. All recipes can be found below!! First your going to need to get a big box of individual bags Fritos! you can find those HERE. I used some galvanized bins to hold all the Frito bags. This is the list of Toppings that are my favorite! Corn, Green peppers, Red peppers, Red onion, Cilantro, Ground Turkey or Beef seasoned with taco seasoning (my favorite is Taco bell seasoning ) Chopped Tomatoes, Black Beans, Kidney Beans, Grated cheese, Olives, & Chopped Lettace. Salad Dressings you will want are Ranch and Catalina. Some of my guests wanted more of a salad so they poured their fritos on top of the lettace and added toppings that way whatever way will work! I served all the topping in 2 big lazy susan trays you can find those HERE . I served the taco bar with a Texas Cole Slaw and Cornbread. I prefer the Krusteaz Brand for my cornbread, it is amazing you can find it HERE . 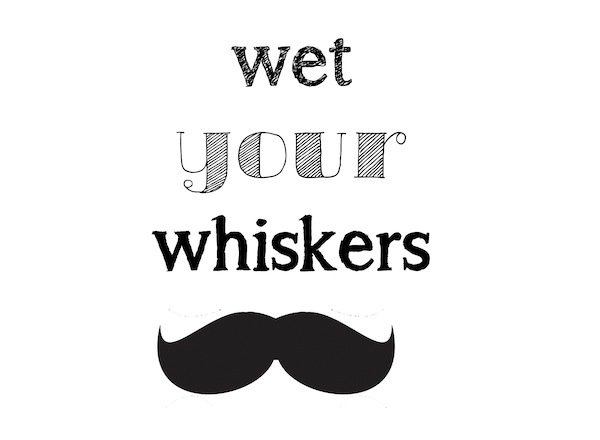 Wet your Whiskers sign can be printed from image, click to save. I added the mustache stickers to white cups. You can get the free printable of the Keep Calm and Grow on HERE . Cornbread Topper papers HERE . Chalk board Easel purchased at Target in the Dollar isle. Mustache Ribbon Found HERE . This Hanging Banner was so Simple to make. All Cut outs were made using the Cricut . Glued together and taped onto fishing line. Now on to the MILK and Cookies, Dessert Bar!!!!!!! MMMMM………. Who doesn’t LOVE milk and cookies?? I know I love it !! So I put all my favorite homemade cookie recipes together for this bar! In the line up I had, Peanut Butter Blossoms, Chocolate Chip, Snickerdoodle, Oatmeal Raisin, and Oreo. All recipes can be found at the bottom of this post!! You are going to want to get 5 large cookie jars with lids HERE is a great choice and price for those! I bought scrapbook paper using the accent color for my party. I found a mustache paper at my local Michaels store. cut the paper according to the size you would like and layer it with the mustache paper. 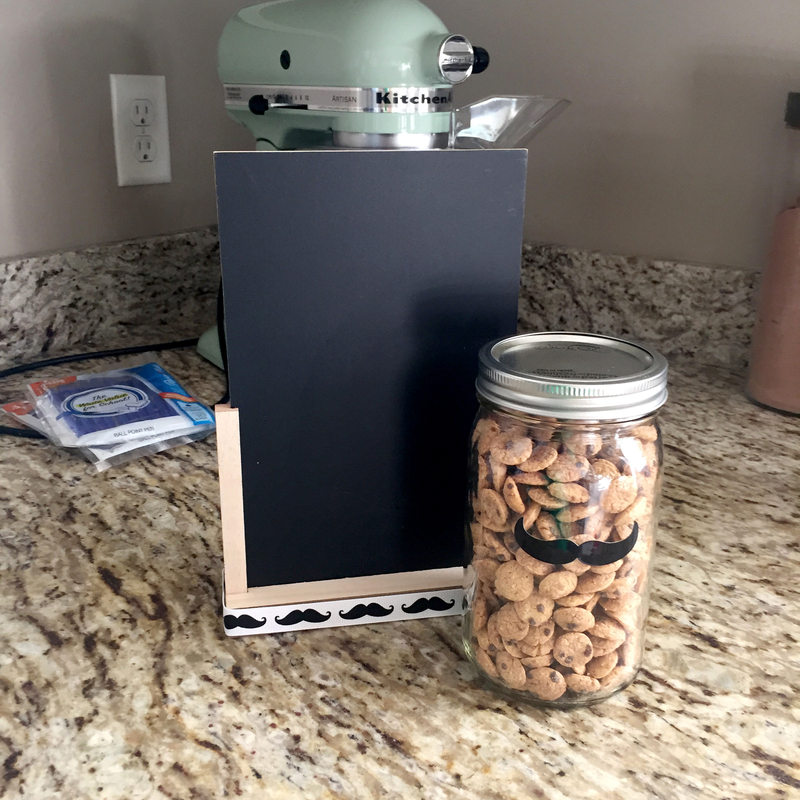 Then I added signs for each jar that were cut out using the Cricut , then I added mustache stickers to those and printed the name of the cookies on colored paper. For the Backdrop I used Black and wHite Striped Fabric you can find HERE . You can find the Free Printable for the, Real Men Eat Cookies sign HERE . 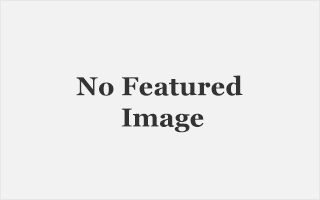 Straws can be found HERE . The Paper Pinwheels Were made using 3 pieces or 12×12 scrapbook paper. You can find a tutorial HERE . Chocolate Mustaches were made using THIS mold. I made them Brown, but also white for a “Milk Mustache”. I used styrofoam disks and blocks with ribbon wrapped around them to display the mustaches. You can get those at the craft store. HOW MANY COOKIES IN THE COOKIE JAR?? Use cookie crisp cereal to fill a jar and have guests guess how many are in it. There is a description of an item and you have to guess which candy bar would work best for the item. 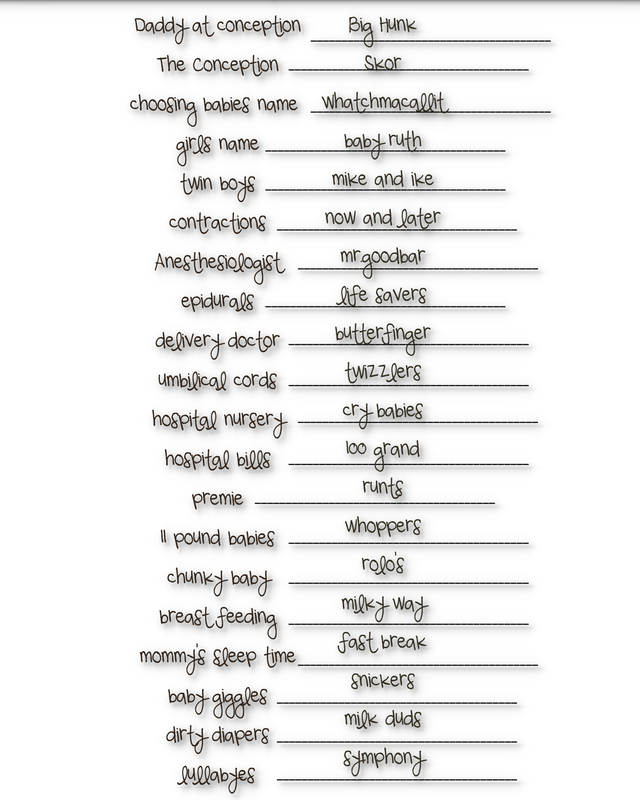 I have also included a fun word search to take up some time. Here is the game printout for the mustache theme and the answer key too! Hope you can have the best shower yet!! Leave comments for questions! Thanks for visiting me!! xoxo.